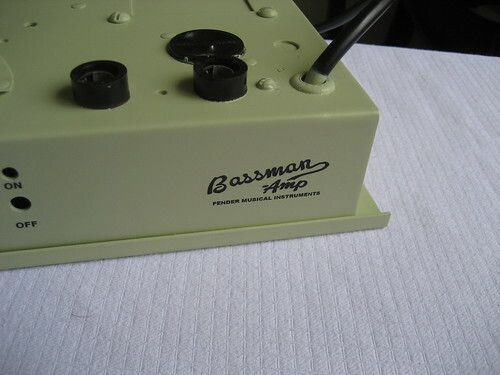 How do you build a Bassman? 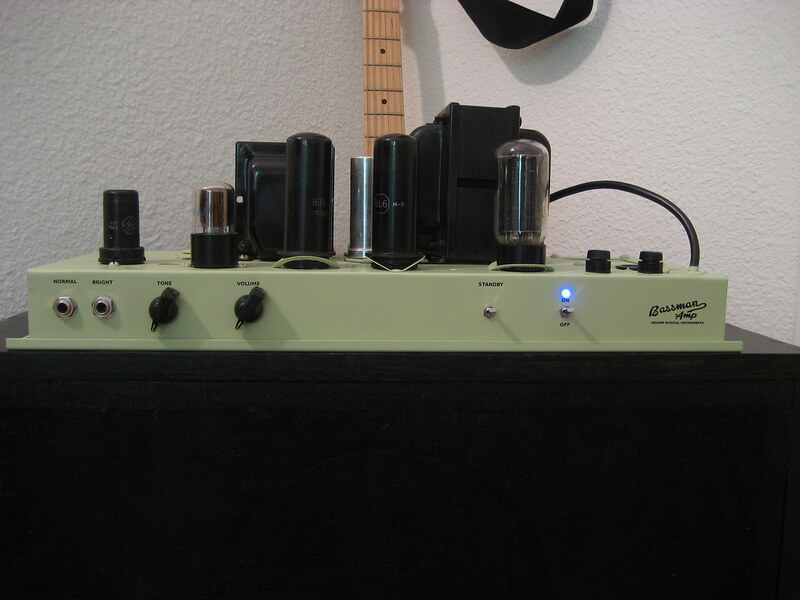 You start with an amp that has everything and cut out everything which is not a Bassman. In this case that involves removing some smaller tube sockets and moving at least one of the octal plugs to the preamp section of the chassis. 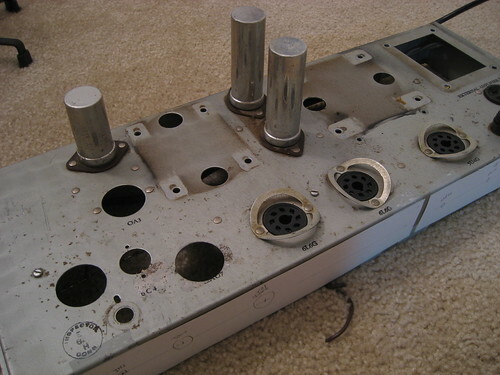 The original layout of this organ amp seemed reasonable. The long ground bus will make for an easy star grounding scheme. 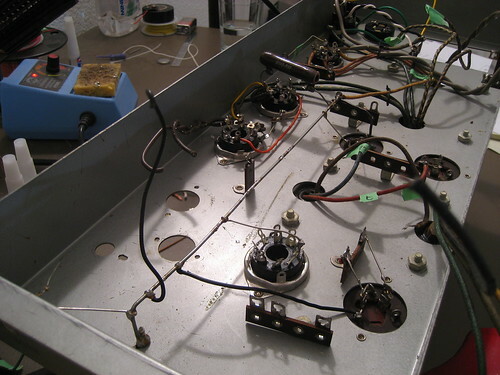 The preamp and phase inverter sockets are placed away from the transformers and as close to the input signal as possible. 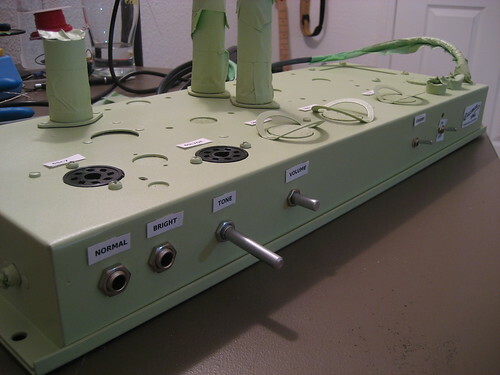 And the tubes are oriented at 90 degrees apart (to reduce induced noise?). I bored out one with a 1-1/8" hole cutting drill bit and then cut an entirely new hole for the 2nd socket. Now I'm left with several extra holes. For safety reasons these need to be blocked off (you want to keep dumb people from poking their fingers into the amp and touching a 400V line). Apparently there are off the shelf hole plugs just for this but I just cut some sheet metal pieces and glued them inside. The big rectangular hole where the unused transformer was I bolted a piece of sheet metal. I was smart this time and started on the chassis finishing before I built I started building the amp. This takes a little bit of up-front planning since you can't just drill holes as you go along but it beats desoldering all the external components after you get everything working perfectly. 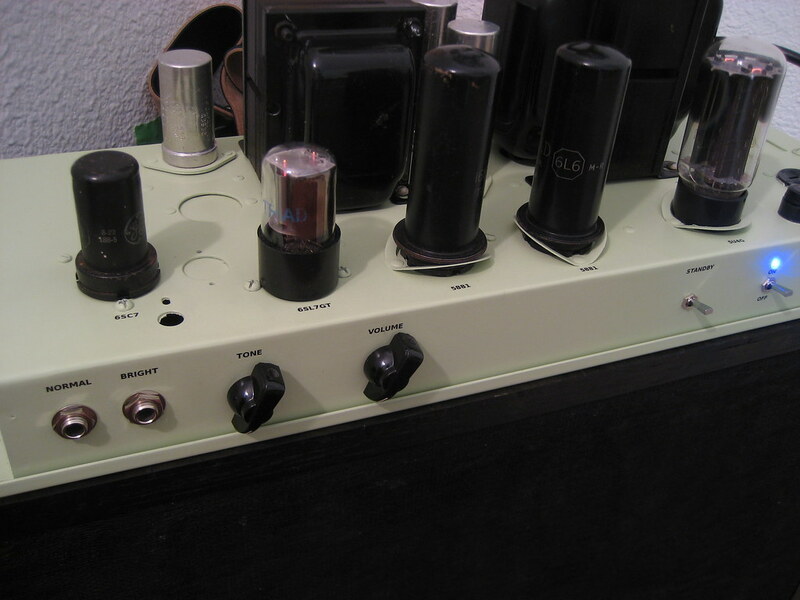 I found some blog posts by a guy who does the markings on his amps using India ink and old cartographer lettering kits. Looks really nice when it's done. 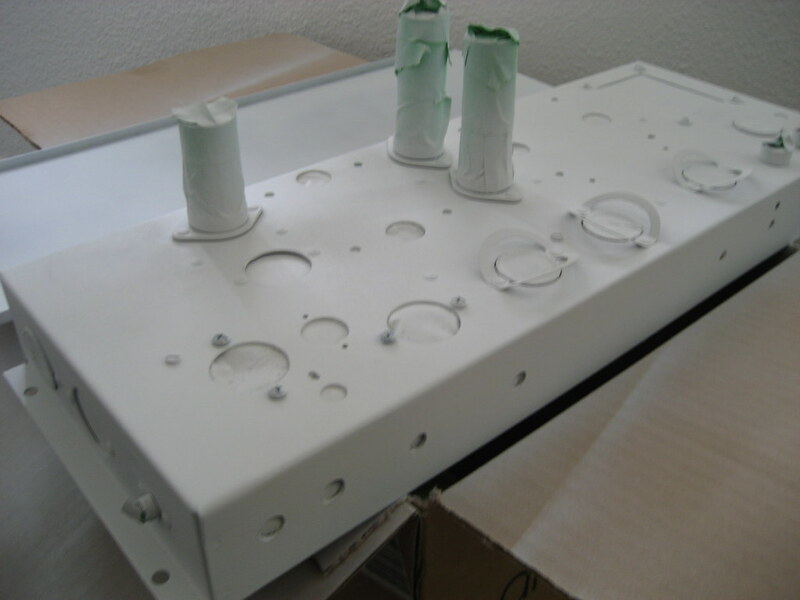 A few coats of white primer and a little sanding. Final paint finish with a glossy paint of some sort. I'm leaning towards a "celery" color. Apply some kind of lacquer coat to seal the decals. There it is after the primer coat. And there after several coats of "celery" gloss spray paint. I don't know much about painting things. It came out kind of rough. The labels are previews of the decals I intend to print with a laser printer and apply. For labels I used "decal stock" for laser printers from Small Bear Electronics. I used GIMP to create a 300 dpi 8.5x11" image. Some text and some graphics and print (make sure you reverse the image!) and bam you've got decals. Here is the finished chassis after applying the decals and a few coats of Krylon gloss acrylic. It looks a little jagged but in decal form it looks pretty good. The decals worked well. It takes some practice to get right (good thing I printed many copies of each piece of text). Next time it will be easier. I would definitely recommend this for on-the-cheap labeling of DIY amps. I had bought 4x 33 uF capacitors for the power supply but the existing stacked capacitors (the shiny cylinders on the top) seem to be fine. The capacitance meter on my multimeter reads 60 uF on the big ones and 30 uF on the smaller. This is odd because they're marked as 40 and 20 uF, respectively. It's also odd because they're probably 60 years old. Apparently USA-made caps last forever. Makes no sense but they'll do. This simplifies the internal wiring since they don't need turrets to wire them to. Well, it worked the first try. But something isn't right. The volume is way too low and the amp is distorting extremely early. The B+ is about 510 VDC - about 110 VDC too high. That can't be good. I'm lucky nothing exploded as my filter caps are only rated to 450 VDC. 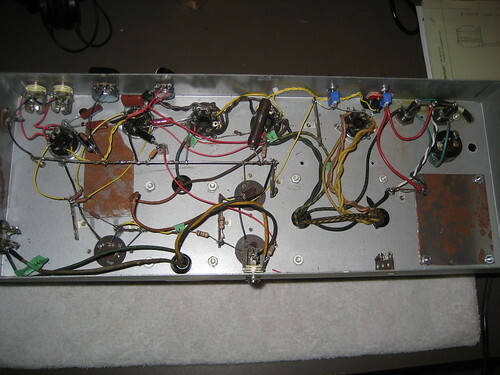 I've ordered a couple 50W Zener diodes (100 and 120 V) to help with this. I'm a little fuzzy on the correct way to do this but the idea is the diode is used to raise the voltage of the power transformer secondary center, thus lowering the differential voltage output. Not much I can do until I fix that. 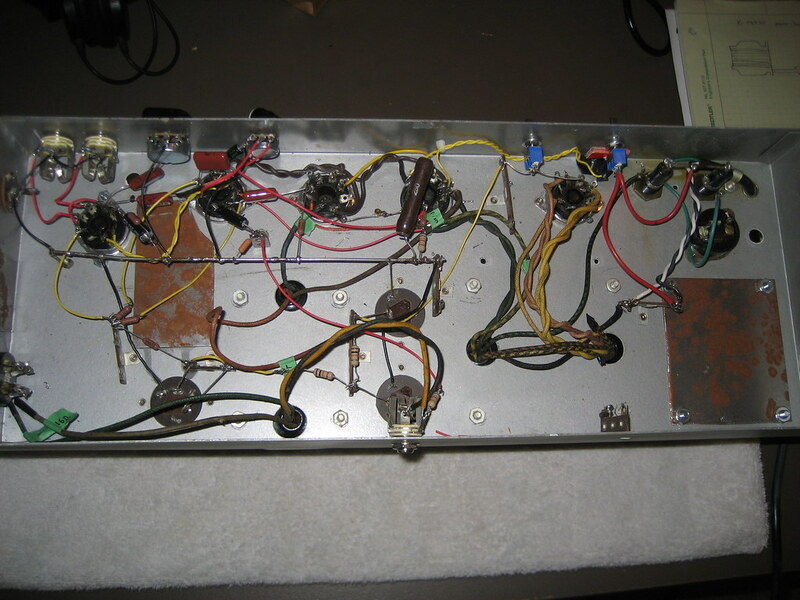 I've played it briefly but definitely don't want to crank it up with the whole circuit biased incorrectly like it is. 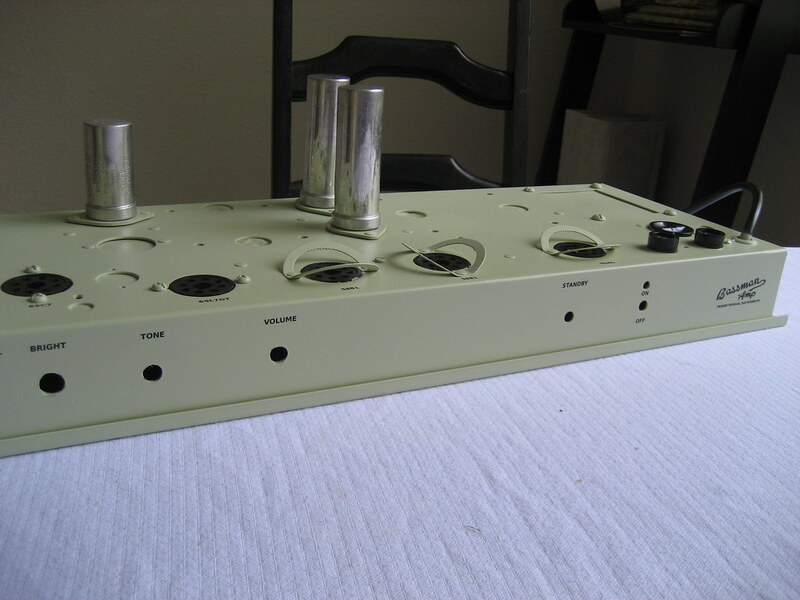 I was able to verify the volume and tone knobs work and aren't backwards. 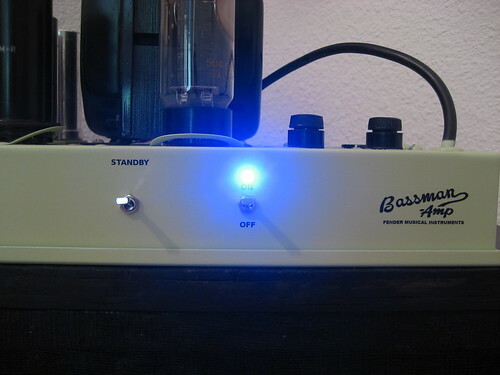 The tone circuit works great.